Moderate moisture to dry. Forest edges and openings, thin woodlands, brushy thickets. Full to partial sun. This is a slow-growing, relatively long-lived, erect shrub that rises on 1 to 10 or more stems. It is not colonial and usually occurs as an isolated individual. The stems are erect, up to 18′ tall, and up to 6¼″ in diameter at breast height, with numerous thorns. The thorns are slender, blackish, 1⅜″ to 2¾″ long, straight, and simple, not compound. The stems usually form a rounded mound. The bark is thin and gray. It is separated into small plate-like scales that are attached in the middle and separated at the top and bottom. Twigs are brown and hairy or hairless the first year, becoming gray and hairless in the third year. 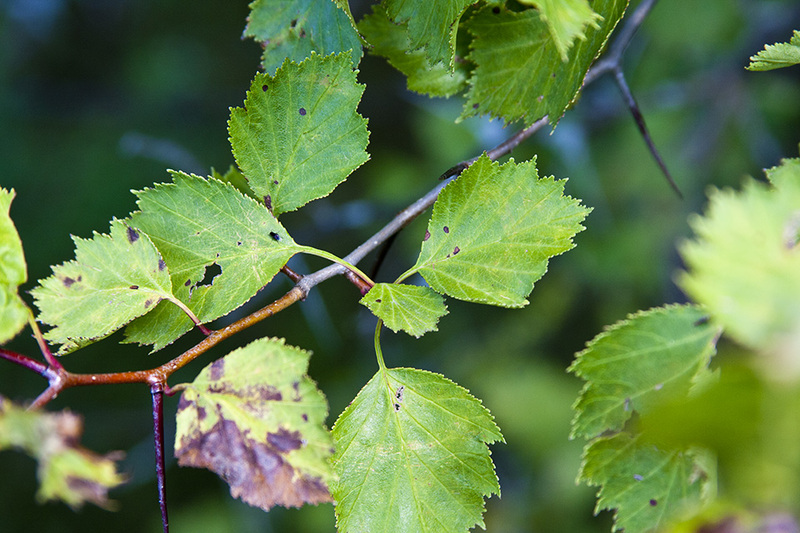 The leaves are alternate, deciduous, and small. They are on ⅜″ to 1″ long leaf stalks (petioles). The petioles are hairy, at least on the upper surface, becoming almost hairless in late summer. They usually have 3 or more stalkless, red glands on the margins. They are ¼ to ⅔ as long as the leaf blades. The leaf blades at maturity are firm, elliptic or almost circular to rhomboid or broadly egg-shaped, 1½″ to 2¾″ long, and 1¼″ to 2¼″ wide. They are narrowly or broadly wedge-shaped at the base and tapered or rounded at the tip. They have 2 to 5 shallow, ⅛″ to 7 ⁄16″ long lobes on each side. 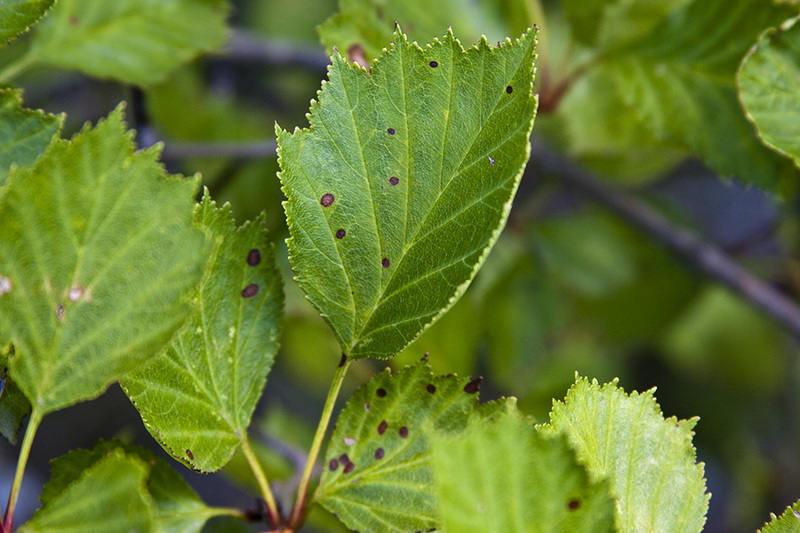 The upper surface is dark green and usually dull, sometimes shiny. It is usually rough to the touch and covered with short, stiff, appressed hairs. The lower surface is covered with longer and softer hairs, especially along the main veins. Both surfaces tend to become almost hairless in late summer. The veins are impressed on the upper surface and raised on the lower surface. The margins are finely toothed with sharp, forward pointing teeth. The teeth are tipped with black glands that are tiny but can be seen without magnification. The inflorescence is a branched, flat-topped or convex cluster (cyme) of 8 to 15 flowers at the end of the stems and branches. The flowers are 9 ⁄16″ to ⅞″ in diameter. There are 5 white petals and usually 6 to 10, sometimes 15 to 20, stamens. The anthers are usually white, sometimes pink. The fruit is a seed capsule with a fleshy, outer covering (pome). The pome is globe-shaped and 5 ⁄16″ to ⅝″ in diameter. It is green at first, becoming yellow or orange, then finally red when it reaches maturity in late August to early September. Bigfruit hawthorn (Crataegus macrosperma) leaf blades are somewhat smaller. They are rounded at the base, the two sides forming an unbroken arc. The lower leaf surface is hairless. The leaf blades appear more deeply lobed (proportionately). Dotted hawthorn (Crataegus punctata) is a small tree rising on a single stem. There are usually compound thorns on the lower part of the stem and on larger branches. The leaf blades are inversely egg-shaped and tapered at the base with concave sides along the base. They are unlobed or have shallow lobes no more than 3 ⁄16″ long. The flowers are larger, up to 1¼″ in diameter. There are 16 to 20 stamens. The fruits are larger, up to ¾″ in diameter. 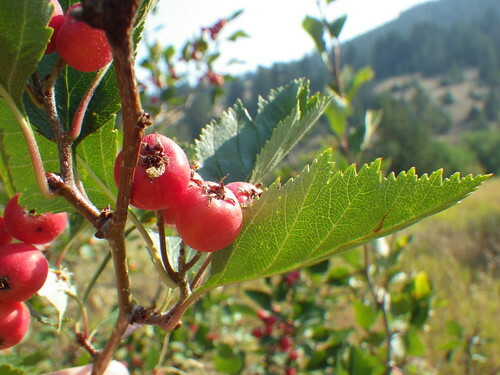 Douglas hawthorn (Crataegus douglasii) has shorter thorns, no more than 1⅛″ long. The fruit turns black when it matures. In Minnesota it has been recorded only in Cook and Lake Counties. 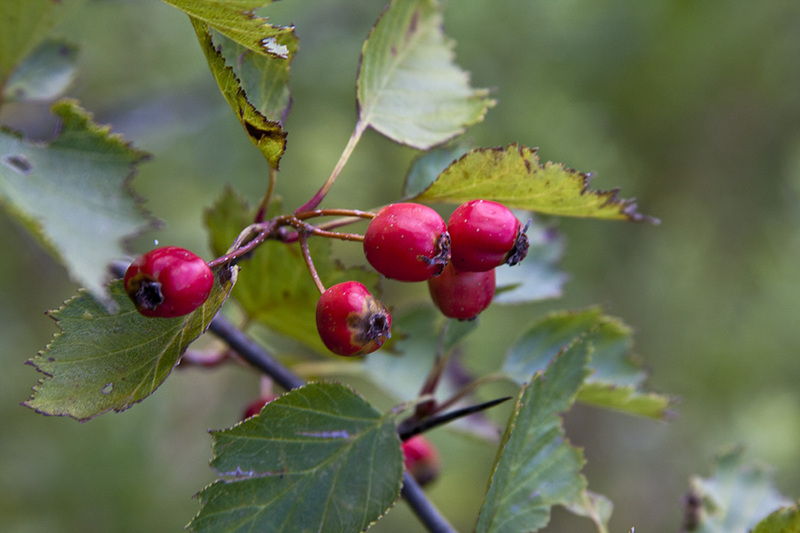 Downy hawthorn (Crataegus mollis) is a small tree rising usually on a single stem, sometimes a few stems. There are usually compound thorns on the lower part of the stem and on larger branches. The leaves are much larger, 2¾″ to 5″ long, and 2⅜″ to 4¾″ wide. The flowers are larger, up to 1¼″ in diameter. There are 17 to 20 stamens. The fruits are larger, up to ¾″ in diameter. Fleshy hawthorn (Crataegus succulenta) is usually a small tree rising on one stem, sometimes a shrub rising on a few stems. It sometimes has compound thorns on the lower part of the stems. Simple thorns are much longer, up to 3½″long. 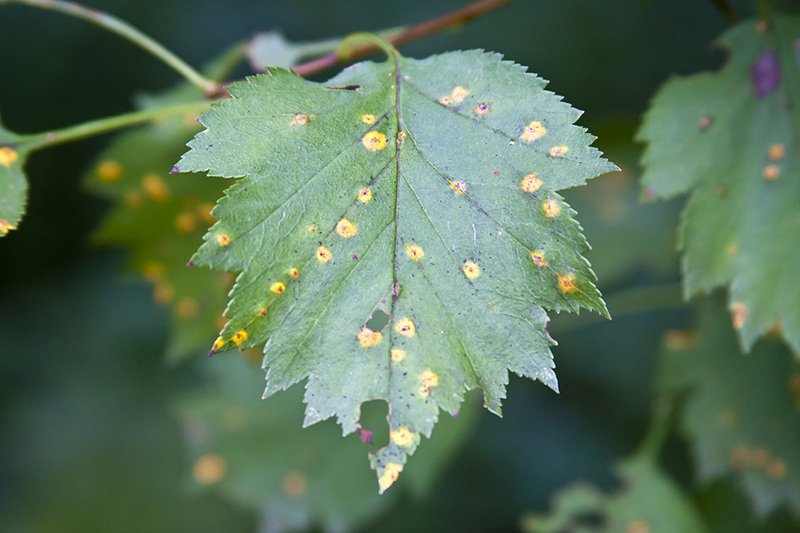 There are no small red glands on the leaf petioles. The leaf blades are more shallowly lobed, the lobes rarely more than ¼″ long. The inflorescence is larger, with 10 to 30 flowers. Large-thorned hawthorn (Crataegus macracantha) sometimes has compound thorns on the lower part of the stems. Simple thorns are much longer, up to 4″ long. There are no small red glands on the leaf petioles. The leaf blades are more shallowly lobed, the lobes rarely more than ¼″ long. The inflorescence is larger, with 10 to 30 flowers. Late hawthorn (Crataegus calpodendron) has numerous compound thorns on the lower part of the stems. The leaf petioles are densely hairy on all surfaces. The leaf blades are much longer, 2″ to 4″ long. The inflorescence is larger, with 15 to 45 flowers. There are 15 to 20 stamens with pink to red anthers. 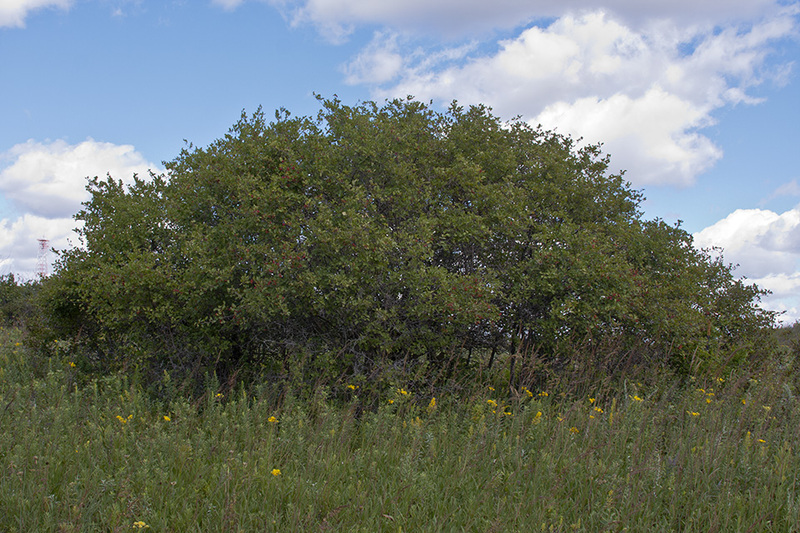 Quebec hawthorn (Crataegus submollis) is a taller shrub, reaching up to 30′ in height. The leaf petioles are densely hairy on all surfaces. The leaves are larger, 2⅜″ to 3¾″ long, and 2⅜″ to 3¼″ wide. 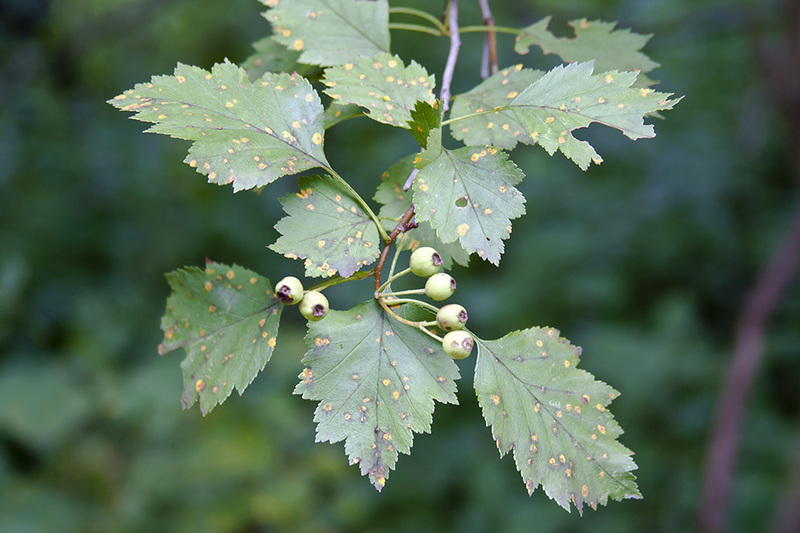 Crataegus is distinctive in usually bearing thorns and commonly having leaves that are both lobed and serrate. Shrubs 4-6 m tall, thorns over 3 cm long, pomes usually reddish, common in open and forested settings and typically forming thickets in ravines and other moist protected settings.